It looks like we are going to fill up this year. I have adjusted the split between the Open and Sprint races based on the relative number of applicants. We will keep the total of both races at 160 pilots to make sure we can get everyone off the hill when conditions are less than ideal. The Sprint Race has 59 pilots confirmed out of 74 who have applied for the 65 available slots. 6 more payment confirmations and the race is full. The Open Race has 90 pilots confirmed out of the 104 who have applied for the 95 available slots. Because of FAI sanctioning requirements we can only confirm foreign pilots for those last 5 slots until the end of May. U.S. pilots who apply are being put on a waiting list. If there are any slots left after May 31 they will go to the first pilots who confirm with a payment. The SuperClinic has 6 of the 14 pilots who applied confirmed for the 20 available slots. I’ve ordered a bigger tent! I have just released the last available slots for the Open Race for U.S. pilots. There are still spots for foreign and Canadian pilots, however. When those U.S. Pilot slots are taken there will be no Open Race slots available unless you are a foreign pilot per your CIVL registration. All that said I do have some Open Race slots that I am holding back for nationally ranked U.S. pilots who have not yet applied and been confirmed with a payment. If you fit in that category please email me after you apply and I will give you payment instructions if you qualify. If not all the foreign pilot slots are filled by May 31, there is a chance a few more unranked U.S. pilots to enter the Open Race. We still have plenty of slots available for the Sprint Race and the SuperClinic. We currently have 143 pilots who have signed up for the three events and 110 pilots who have confirmed their attendance with a payment. The Sprint Race and the SuperClinic have plenty of positions open. The Open Race, however, is bumping the limit even with 10 positions recently approved to be added. The Open race is still accepting applications but only waiting list payments are allowed for U.S. pilots as we are required to hold slots open for foreign pilots till June 1. Pilots on the waiting list will be notified when/if they are accepted or given a full refund. Canadian and foreign pilots still have slots available to confirm with a payment in all events. I’ll send an update as the status changes. Thanks for your support in the first two weeks of registrations. We currently have 137 pilots who have signed up for the three events and 107 pilots who have confirmed their attendance with a payment. The Open race is still accepting applications but no confirmation payments are allowed for U.S. pilots as we are required to hold slots open for foreign pilots till June 1. Canadian and foreign pilots still have slots available to confirm. I’ll send an update as the status changes. Still plenty of openings in the Sprint Race and SuperClinic . I think I may need to order a larger tent for HQ. The Competition Committee at USHPA has approved our application for 2019. So mark you calendars for June 15-22. -Returning pilots from the 2018 event are eligible for a $50 discount coupon. We are also planning a trade fair and a chance to demo gliders and other equipment ahead of the competition. More on that later as the plans develop. 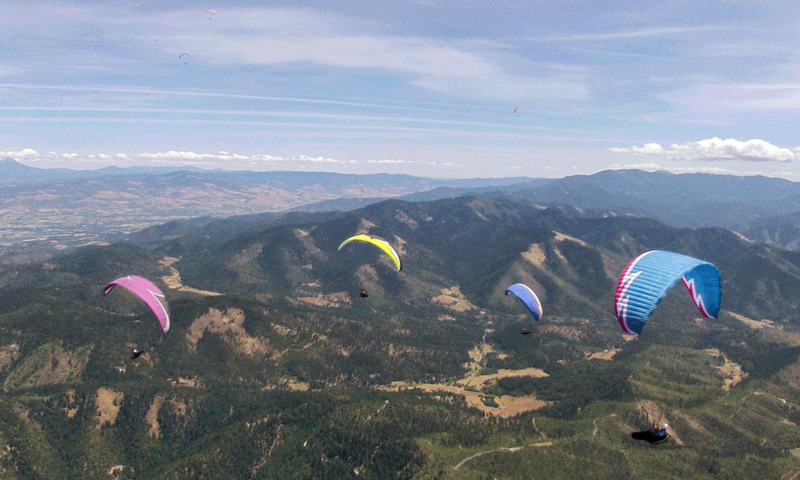 When the organizers of the Rat Race announced that 2017 would be their last year producing the competition, a group of local Rogue Valley Hang Gliding and Paragliding (RVHPA) pilots got together to look at the feasibility of continuing the event. We knew it was going to be a huge undertaking, but with the outpouring of support from the international paragliding community and the local Applegate community, we have been inspired to create a new competition that will not only uphold the high standards set by the Rat Race but also bring new life to the event as a whole. We feel very fortunate that nearly all of the key team members who made the events at Woodrat a success over the past 15 years have been recruited and will be collaborating with us on the very first Applegate Open. This being the first year the local club will produce the competition, there are many start-up expenses and investments that need to be made in order to make this an outstanding competition that we can all enjoy for years to come. We plan on opening the books and sharing our expenses with everyone who has entered and hopefully we can cut expenses and registration fees more in succeeding years. We are happy to announce that LongSword Vineyard has agreed to host the new competition headquarters. As the primary landing zone and longtime supporter of the local paragliding community, we feel this collaboration is a natural evolution of our existing relationship and will provide a fantastic overall experience for everyone involved. We look forward to welcoming you all back to our valley.